Now, it’s time for me to renew that promise to you: As your next county judge, I will continue my commitment to limiting the size of government, keeping taxes low, pursuing excellence in county government, and defending personal liberty! After all, those are the bedrock principles that Collin County’s success is built upon. It would be easy to look at our accomplishments and become complacent. Even now, others want to chip away at that foundation with tax increases, runaway spending, and overreaching regulations. 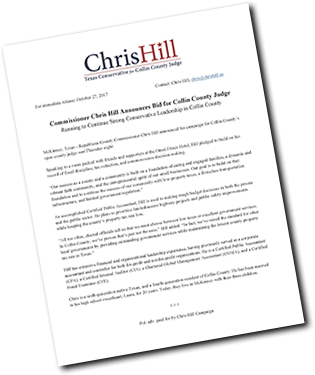 It’s clear we have a long road ahead of us, and I need your help to keep Collin County conservative and prosperous. With your help and partnership, we can keep Collin County the best place to live, work, and raise a family!